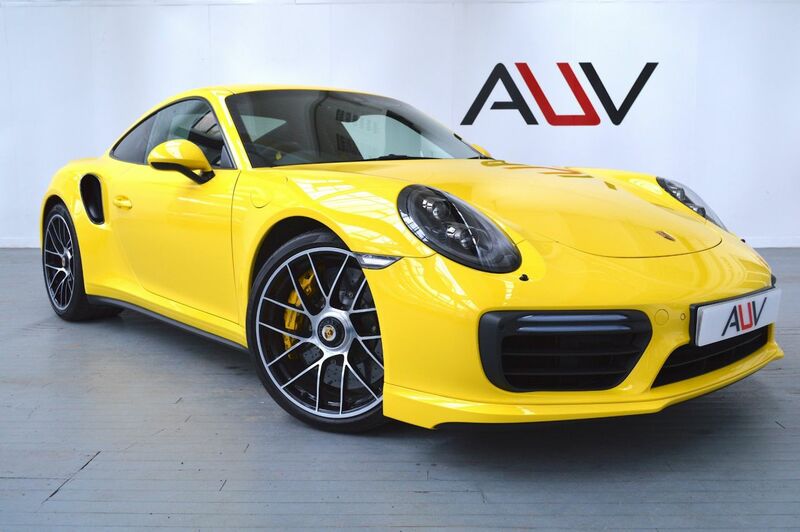 We are very excited to have in the showroom today this fantastic Gen 2 Porsche 991 Turbo S PDK in Racing Yellow. The car is very well specified with the following. Heated Carbon sport bucket seats with Porsche crest embossed headrest's, Racing yellow seatbelts, Ceramic brakes (PCCB), Bose Premium surround sound system with USB/I-Pod interface, DAB Radio, Multifunction Heated GT Steering wheel with electric height & reach adjustment, Park assist front & rear with reversing camera, Turbo 3 20 inch alloy wheels, PDLS+ Dynamic high beam, Dynamic LED Cornering lights, LED Daytime driving lights, Dark headlights with Gloss black heated washer jets, Navigation High, Sports Chrono Plus package, Sport design exterior mirrors with auto dimming, PTV Plus Electronic rear diff, Electronic damper control for PASM & PDCC, Rear axle steering, VTS Security with PCC, Engine stop-start function, Serviced by Porsche Reading at 6611 miles with Porsche Warranty until 23rd April 2019. Before you reserve a vehicle we ask that you read both our Business and Warranty conditions in the 'Terms' tab above. Specialists in vehicle financing we can offer our clients market leading, bespoke funding packages. Finance examples are subject to status, regulated and monitored by the FCA. Goods and services are supplied by Approved Used Vehicles Ltd. For further information on how to reserve this vehicle or tailor your finance package please call us on 01455 446505.